Local Advertising Agency, Advanced Marketing Strategies, Celebrates Its 25th year With Memorable Marketing Hits, Like the Mossy Nissan Jingle. San Diegans might not know who created the Mossy Nissan jingle, but they can probably can sing it! “Mossy Nissan Moves You” was the brain-child of Advanced Marketing Strategies (AM Strategies). This local advertising agency has been responsible for some of San Diego’s most memorable marketing; including campaigns for clients like IKEA, Mossy Automotive, Henry's Market Place, McMillin Homes, Bekins Moving and Storage, San Diego County Credit Union, Soboba Casino and many others! And now they're celebrating their 25th year in business here in San Diego. Mark Stevens, AM Strategies Media Director, says, “I've never seen anything like it in my many years of buying national and local media; the unique and proprietary buying system, AM Strategies owns, allows me to uncover opportunities other buyers just can't see. And buying both traditional and digital media frees me up to customize and recommend the media mix that is just right for each the client." 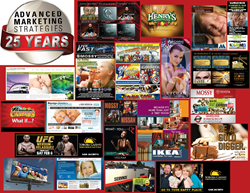 Advanced Marketing Strategies has provided over 25 years of strategy based, result-oriented marketing solutions that have increased traffic, sales, and profits for their clients and are looking forward to many more years in San Diego.